It’s hard to believe that holiday shopping season is upon us. As a marketer, you’ve either been planning for this time of year for months, or you’re starting to panic. Either way, we’ve got plenty of ideas coming your way to help you take advantage of prime marketing time. For starters, take a look at what Google recently had to say about an important 2016 holiday shopping trend: Gift-guide videos. How can you take advantage of the gift-guide trend? These videos tend to be unpolished, so don’t worry if you don’t have a team to create slick videos for you. Gift-guide videos are ideal for retailers and bloggers — and can even incorporate giveaways. To help you wrap your head around the concept, we dug up a couple of examples from 2015 that will give you an idea of what these gift-guides look like. This first example is from lifestyle blogger Aspyn Ovard; it includes holiday decorating tips, DIY gift ideas and even some fun gift-wrapping suggestions. The next example — from Emily Canham, a UK-based beauty blogger — features a giveaway. As you can see, Dom is much more sedate than Aspyn and Emily. We don’t even see his face! Dare we say anyone could make a video like Dom’s? Here’s some motivation: in the consumer electronics category, 68% of smartphone shoppers turn to YouTube for ideas about what to buy (according to the Google story mentioned earlier) so video is definitely one way to capture some of their attention. Ready to make a gift-guide video of your own so you can grab some of those smartphone-using holiday shoppers? Below are step-by-step instructions for how to combine a gift-guide video with a marketing Campaign to go along with it. Note: Before you begin, you’ll want to have your video(s) ready to go, and uploaded to either YouTube or Vimeo. 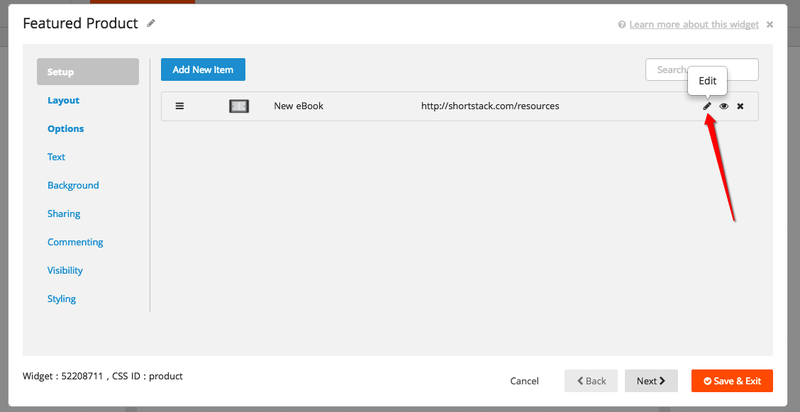 Start with ShortStack’s Product Promotion template. 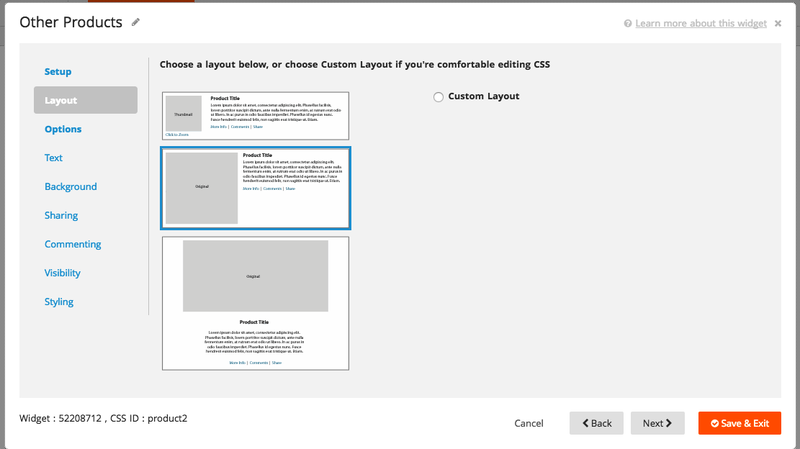 Select the Edit icon on the top Image Widget to change the header image for your Campaign. Upload a graphic, or use the Canva integration to create one. Save and exit. Select the Edit icon on the Rich Text Widget to add information about your company and products. Save and exit. Next, on the Featured Product Widget, you’re going to embed a video instead of uploading an image. (You can also do both, if you want to!) Click on the Edit icon to open the Widget settings. Then, select the Edit icon for the product added as an example. 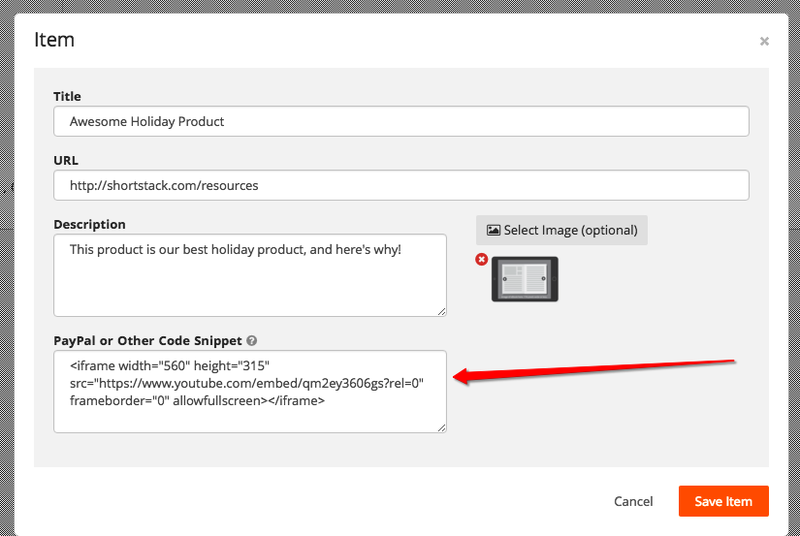 In the “PayPal or Other Code Snippet” box, paste video embed code from YouTube or Vimeo (wherever your video is hosted). You can choose to remove the image by clicking the small red X, or select an image to take its place. Be sure to also customize the text fields to share information about your product and where visitors can find it. Save Item, and then Save and Exit. Next, edit the Other Products Widget, which is below the Featured Product Widget. You’ll follow the same instructions as above to add additional products. You may decide to choose another layout of your products. Before you test and publish your Campaign, be sure to edit the bottom Links Widget so that each button directs users to your website and social channels. Then, choose a theme from the Themes menu, which is accessed by the paintbrush icon at the top of the Campaign Builder. Select the tree icon to view holiday themes. Select the holiday theme you like, and select Save. You’re ready to publish! Click the orange Publish Campaign button, and you can start promoting your Gift Guide Video Campaign.